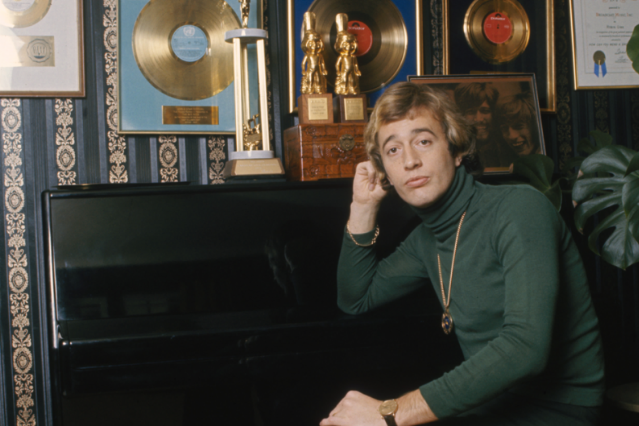 Robin Gibb, who died after a lengthy fight with cancer on May 20, spent most of his career as the member of the Bee Gees who sang but didn’t (often) play instruments. In the early years of the band, he was the lead vocalist on most of the fragile, emotionally raw ballads that made the Brothers’ name; once the disco explosion hit in the mid-’70s, he usually played a supporting role to Barry Gibb, the group’s powerhouse falsetto, guitarist, and chief songwriter. But his pure, controlled high tenor voice was almost always part of the Bee Gees’ mix, and he had a sideline as a solo artist, too. Here are some of the songs that show off his gifts best. Robin’s first great vocal showcase was inspired by a Welsh mining disaster, despite its title (which is nowhere in its lyrics). The dynamic of the Bee Gees was a little bit tough to communicate early on, as in this 1967 promo video for the first American single the band released (immediately after their label had been hoping to get them across as the Beatles recording under a pseudonym): a group with two lead singers, one of whom also played an instrument onstage (Barry) and one of whom didn’t (Robin), wasn’t the ordinary way of doing things. The Bee Gees were a live act for years before they ever made records, and this onstage performance of one of Robin’s most heartrending songs — which now sounds like a premonition of his career and his mortality — is a remarkable example of how precisely and delicately he could sing, even with an orchestra behind him. A highlight of Robin’s live performances right up to the end of his career, “Massachusetts” was yet another tribute to the mysterious U.S. landscape from this British/Australian band. It was a No. 1 single in the U.K. and most of Europe, and one of the Bee Gees’ signature songs in their pre-disco era. The disco period of the Bee Gees was much more focused on Barry’s vocals than on Robin’s, and although Robin usually sang lead on one or two songs per album, Barry took over for most of their hits. One great exception was “Nights on Broadway,” for which the brothers took turns with the lead; in this live performance, you can see the way they traded off with each other. If you haven’t heard this solo single by Robin (co-written by his brother Maurice), that’s totally understandable — it’s almost entirely unknown in the U.S. In Europe, though, it was an enormous hit, the synth-pop anthem of the summer of 1983, with an arrangement that complements Robin’s tremulous, reedy falsetto with glistening synthesizers.